The federal Liberal government will begin levying its carbon tax on greenhouse gas-emitting fuels today in the four provinces that have refused to take part in the pan-Canadian climate framework. The tax or levy is designed to lower the country’s carbon emissions so Canada can meet the reduction targets it agreed to at the Paris climate summit. In Ontario, Manitoba, New Brunswick and Saskatchewan, where conservative-minded governments have steadfastly opposed any sort of carbon pricing scheme, Ottawa will apply its carbon tax on fossil fuels — which starts this year at $20 per tonne of GHG emissions. In the provinces that already have other carbon pricing measures, such as Alberta, B.C. and Quebec, nothing changes, since they have models Ottawa has deemed acceptable. The four provincial governments opposed to Prime Minister Justin Trudeau’s plan — along with the federal Conservative party — fear it will be economically damaging and far too punitive for consumers and small businesses. Supporters of the Liberal plan say the threat of climate change demands action and a revenue-neutral plan of this sort is the best way to shift patterns of consumption away from GHG-emitting fossil fuels. How much is this whole thing going to cost me? Based on federal figures, the tax in the four non-compliant provinces will result in an approximate cost increase of 4.42 cents a litre for gasoline, 5.37 cents for light fuel oil (home heating fuel), 3.91 cents per cubic metre for natural gas and 3.10 cents per litre for propane. 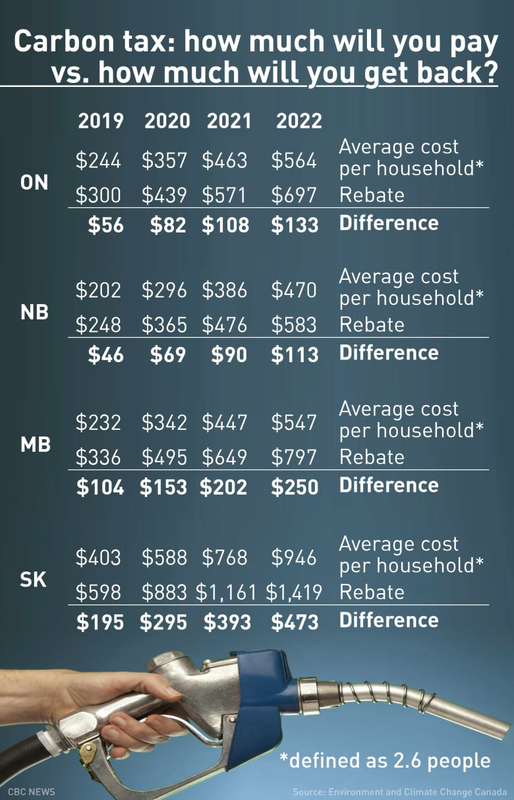 Based on those figures, and according to calculations by CBC News, the average Ontario household will pay roughly $10 more a month for natural gas (based on average of 252 m3 of consumption) as of April 1. The figure will be considerably lower in the summer but possibly much higher in the winter, when natural gas consumption for home heating spikes. The average Ontario household, for example, consumes about 419 m3 of natural gas in January but only 51 m3 in July, according to data supplied to CBC News by the Ontario Energy Board regulator. The cost to fill an empty residential oil tank, which are common in places like rural New Brunswick and vary greatly in size, will increase by about $48 for a 910-litre model. The cost to fully refuel a Honda Civic (based on a 47-litre tank) will increase by about $2, while a full fill-up for a Ford Explorer SUV will cost about $3 more. Those costs are expected to rise each year as the carbon tax increases by $10/tonne until it hits $50 in 2022 — meaning those costs will more than double in less than three years’ time. Consumers will not pay the tax directly to the federal government; rather, Ottawa will impose the tax on fuel and production and distribution companies, which will in turn pass on those costs to customers. A carbon price will be levied in the three northern territories starting July 1, 2019. How much will I get as a carbon rebate? To compensate for the cost of living increase, the federal government has vowed to return every single dollar it collects in carbon tax to the people in the province in which it was collected — an attempt to make household budgets whole on the money they’ll shell out as part of this carbon reduction scheme. In fact, some Canadians are already set to receive the ‘Climate Action Incentive payment’, or rebate. It’s paid to eligible taxpayers who claim it on their 2018 tax return with the Canada Revenue Agency. Ottawa has said future payments will be made annually and will reflect about a year’s worth of emissions. In Ontario: about $300 a year. If a taxpayer is entitled to a tax refund, that refund would be boosted by the amount each household is entitled to under the new climate incentive payment program. If you owe the federal government money at tax time, that amount would be reduced by the amount you stand to gain from this initiative. There is only one rebate or tax reduction per household. The amount will vary based on the province and the number of people in a household. The payment is not a means-tested benefit and does not depend on income levels. For example, a single adult in Ontario would see about $154 next year from the payment. Is the carbon tax revenue-neutral? While the federal government has insisted the carbon tax will be revenue-neutral for the federal government, a government official speaking at a technical briefing for journalists acknowledged that some Canadians — about 30 per cent of them — will pay more per year in carbon taxes than they stand to gain from the new rebate program. The official said these people are more likely to be wealthier Canadians who have to heat bigger homes or own larger vehicles. The government says the other 70 per cent of Canadians will receive more in climate rebate payments than they’ll pay each year through the new carbon tax. Why are the federal Liberals doing this? Canada signed on to ambitious emissions reduction targets at the Paris climate accord meeting in 2015. A national pricing strategy is seen by Ottawa as the best way to live up to the accord. The Liberal government maintained the same targets set by the former Conservative government: 17 per cent below 2005 levels by 2020 and 30 per cent below by 2030. The government projects the pricing plan will reduce carbon pollution by 50 million to 60 million tonnes by 2022 — the equivalent of taking 12 million cars off the road, or closing 14 coal plants. But the federal government has conceded a carbon price alone won’t be enough to meet those Paris targets. The national climate plan also includes other measures to battle climate change, including new building codes to boost energy efficiency, more charging stations for electric cars, expansion of clean electricity sources and upgrades to power grids. Has a carbon tax ever worked before? In 2008, B.C. implemented North America’s first broad-based carbon tax. The province has seen some success with its carbon-neutral plan: it lowered income taxes to compensate for an increase in consumption taxes on fossil fuels — the bottom two personal income tax rates were cut, low-income families got a tax credit and the corporate tax rate was slashed. And according to B.C. government figures, provincial real GDP grew more than 17 per cent, while net emissions declined by 4.7 per cent, between 2007 and 2015.